There are different types of partials and dentures, but they share their common function. They replace teeth that have become loose or been lost due to bone loss. The entire mouth is examined and a determination is made as to which teeth will have to be removed, and which will remain. The loose teeth are then extracted. Dentures are fitted to go over or around whatever teeth remain in the mouth, depending on the type. There is an adjustment period after dentures are placed in the mouth, and it can take some getting used to. Often implants can used to further stabilize the dentures. Dental implants mirror the size and shape of a patient’s natural tooth. This implant is often as strong as the patient’s original tooth. The implant or artificial root is placed into the jawbone under local anesthesia, then allowed to heal and integrate with the bone. Once the healing process is completed and the jawbone is attached to the implant, the patient returns to the dental office where the implant is fitted with the new tooth. This process generally takes anywhere from three to eight months. Dental implants can last for decades when given proper care. A root canal is a procedure that extracts decayed pulp from the central part of the tooth, reshapes the canal and replaces it with strengthening filler. This preserves the tooth and retains its original integrity; thereby, saving a tooth that in the past would have to have been pulled. An extraction is the complete removal of a tooth. Depending on the complexity of the case, an extraction can be performed surgically or non-surgically. A mild anesthesia is used to ensure your child is as comfortable as possible throughout the procedure. There are a number of different reasons a tooth may need to be extracted (pulled). Some teeth are removed because they are severely decayed; others may have advanced periodontal disease or have broken in a way that cannot be repaired. In some cases, the tooth is simply not repairable, with decay extending far below the gum-line extensive bone loss due to periodontal disease. Learn more about tooth extractions. A trip to the dentist is something most people do not look forward to. 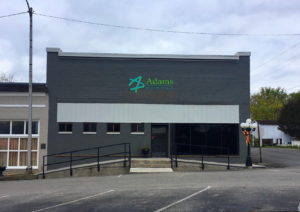 At Adams Dental, we make every effort to be gentle to our patients. We are sensitive to the needs of each patient and do our best to make each office visit a positive experience. We care about each one of our patients and treat them with gentle, loving care.